In order to inaugurate the partnership between Istituto di Alti Studi in Geopolitica e Scienze Ausiliare (IsAG) and the Mongolian Institute of Geopolitical Studies, aimed at a joint study and analysis of Eurasian integration and the balance of power in Northeast Asia, IsAG interviewed Choinkhor Jalbuu, Ambassador, Founder, Chairman at Mongolian Institute for Geopolitical Studies, to better understand the current status of Mongolia, enshrined between two superpowers such as China and Russia, and its prospects in international relations. Q:In the last years Mongolia has drawn the International Community’s attention thanks to its double-digit economic growth (one of the fastest growth rate in the world) and a new international activism. In your opinion, which are the most significant steps in Mongolian economic and political revival? A: Mongolia enjoyed double digit growth because of global mining investors becoming interested in the significant mineral endowment of Mongolia and invested several billions of dollars in the country, which caused mining boom. Also, democracy continued to develop with functioning democratic institutions in Mongolia. However, lately, growth sharply fell to single digit as foreign investment actually stopped because of the lack of understanding and final agreement between the Mongolian authorities and the mining investors. Therefore, most significant step in Mongolia is to improve good governance to rebuild itself as globally attractive investment destination. Q: Mongolia is located in one of the most dynamic region of the world, East Asia, and in particular it is in the heart of Northeast Asia, between two giants like Russia and China, with whom it shares long historical ties. Currently how are the relations of Mongolia with those two States? A: From the geopolitical point of view, seemingly there are few countries with specific geographical location like today’s Mongolia sandwiched between two big powers. The two neighbors, China and Russia, are the powers that have tens of time greater geographical size, population and economic potential than Mongolia. Worldwide influential these two countries, that have been expanding its geopolitical reach for hundreds of years, has possibility to directly and indirectly affect and influence Mongolia, landlocked and undeveloped country with weak capacity. And that has always been the case. It is obvious that Mongolia is more dependent on China and Russia due to the fact it has common boundaries only with these two Powers. There is an important clause in Foreign policy concept of Mongolia that emphasizes friendly relations and mutual cooperation with these two neighbors. Firstly, the three Nations are contiguous neighbors in terms of geography and environment. There is a saying that neighbors are not chosen. Mongolia did not choose China and they didn’t choose Mongolia. Today the three independent Nations, China, Mongolia and Russia, exist adjacent to each other. Our rivers flow through each other’s territory. Our lakes splash as common border in between. Animals like antelopes and forest bears regularly “ violate ” the state borders meticulously defined with great efforts. If a forest fire breaks out, both Mongolians and Russians are equally in trouble. If a prairie fire breaks out, both Mongolians and Chinese are equally in trouble. They genuinely help each other in times of need. And they share their happiness in good days. This is the destiny of our three Nations. Secondly, the three Nations are neighbors that have been exposed to the relationship and connection lasted for centuries and millenniums in terms of history. Generally speaking, neighboring countries and Nations have both strained or amicable relations in the long historical span of time. They go united or divided, they occupy or remain occupied. This kind of history could be seen anywhere or everywhere. The three nations, China, Mongolia and Russia did not avoid that kind of history. As a humble student of international relations I do not know any country or nation that has not come through this kind of destiny. Thirdly, the three Nations are neighbors having blood connection if details revealed. The people of the same ethnic origin have been inhabiting through centuries and decades in our three countries enjoying friendship and cooperation. There are hundreds and thousands of mixed marriages between them. For example entire autonomies regions, republics, provinces and areas, aimags and somons representing important administrative units of some countries are of the same ethnic population as those in its neighbors. It’s a factual reflection of the historic ties that witnessed centuries. Fourthly, the three Nations are neighbors who have profound bonds in cultural and religious terms. The three Nations as centuries old immediate neighbors have so many things in common as far as culture and religion are concerned and great values they have been sharing. Mongolia has very old and complicated in general relations with its neighbours China and Russia. Lately relations have improved. Heads of States of these superpowers have visited Mongolia. China is providing meaningful financial assistance to Mongolia and Russia relaxed various restrictions on Mongolia. Q: Given the importance of the Northeast Asia in the energy sector, which role could Mongolia play? A: It is in the national interests of Mongolia to follow example of other successful landlocked countries such as Switzerland to integrate economically with neighbouring economies, in our case with China and Russia while maintaining political and cultural ties, sovereignty and independence. Mongolia has significant reserves. With its vast coal deposits Mongolia is in a position to act as coal based power and energy exporter to China. Mongolia’s geographical location allows it to be the bridge between Europe and Asia, Russia and China. However we can not understand that the gas pipeline, broadly acclaimed as the Deal of the Century between Russia and China, the high-speed railway line between China and Europe via Central Asia, as well as the new trans-Siberian Beijing – Moscow railway, all go around Mongolia, surprisingly avoiding the less expensive and time saving shortcut through the Mongolian plateau. This might be a kind of shadow from the so-called Strategic Triangle if we judge from the geopolitical point of view. Somehow the Mongolians have to survive, but we don’t think the Russians and the Chinese, our good neighbors, forgot that the significant reserve of world’s drinking water originates from the highland of Mongolia. Q: Notwithstanding the economic growth of the region, East Asia still enshrines contentious issues such as those in Korean peninsula that pose a threat to the stability of the region. Given the good relations of Mongolia with North Korea, could it act as a facilitator (as already done for example in the case of Japan – North Korea talks) to contribute to opening up the closest country in the world and reconciling it with the International Community? A: Mongolia already acts as facilitator. Using its traditional relations, Mongolia is willing to economically and otherwise engage more North Korea helping them to open up the country. There are some discussions in progress and perhaps Japan, South Korea and other powers of six-party talks will support Mongolia’s engagement of North Korea. When President of Mongolia proposed two years ago the so-called Ulaanbaatar dialogue to be continued in the years to come, he definitely had in mind the issues in North East Asia, especially the still continuing tension in the Korean peninsula. Q: Mongolian policy does not seem limited to Asia. In fact, through its “Third Neighbor policy” Mongolia made strong ties with global players such as US, the EU, Japan, South Korea, India and Australia. Some analysts consider this policy as a tool to balance Russia and China’s influence over Mongolia. Could you explain the meaning and scope of this policy? A: In Mongolia’s Foreign policy concept, an important direction is outlined and underlined to develop relations of partnership and cooperation with the USA, Japan, European Union, India, Republic of Korea, Turkey and many other Asian and European countries and unions in the framework of its “ Third neighbor policy”. Mongolia’s foreign policy is defined peace-loving, open, independent and multi-pillar. Therefore, why not to regard the “ Third neighbor policy “ as one of the fundamental pillars of Mongolia’s Foreign policy? We think that Mongolia should not always be dependent on one of the two immediate neighbors or on both as for all issues that may arise. We consider that issues of the third neighbor shouldn’t be limited to the framework of security and political issues. In the contemporary world, existence of any country, its development and prosperity and geopolitical interests are not relative only to military and strategic issues, but also intertwined with the solution of trade, economic, investment and social problems especially from the need for developing bilateral and multilateral cooperation of Nations aimed at reducing poverty and for exchange of the benefits of science technology and information. This is a factor that expands the concept of “third neighbor”. Mongolia enjoy good relations with third neighbors. Third neighbors have all things that Mongolia needs, for example well developed good governance, know-how, advanced technology, etc. Q: The most remarkable sign of Mongolia is its renewed activism on the international stage. For example, we could mention its participation in NATO’s Partnership for Peace, involvement in UN peacekeeping operations, admission in Organization for Security and Cooperation in Europe in 2012. Moreover, it hosted Community of Democracies in Ulaanbaatar in April 2013, World Environment Day in June 2013 and in the 2016 Mongolia will chair ASEM meeting. In this last case we observe a handover between Italy and Mongolia. What is your opinion about the achievement of the ASEM meeting held in Italy? 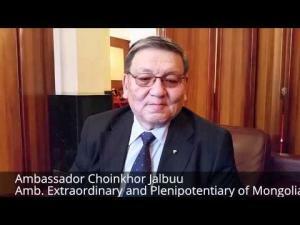 What should Mongolian chairmanship of ASEM be oriented to? A: Foreign and domestic policy of any country and its geopolitical interests are defined by a good number of factors including geographical location of the country, landscape specifics, natural resources, identity of inhabiting Nation, its tradition and legacy as well as its defense, scientific, technological, economic and intellectual potentials. It is more obvious on the example of small countries like Mongolia. Geopolitics or the Politics of Space represents a practice, art and science in their combination on the definition of the ways and means to implement the political, military-strategic, economic and societal policy of a given Nation in the geographical environment historically emerged, being emerged or to-be-emerged and in the intellectual and civilizational framework traditionally consolidated, being consolidated or to-be-consolidated as a result of the successful safeguarding of National identity. Mongolia’s renewed activism in its international relations, as you described above, does not stem from the desire to become an important player even on the regional level, but from its anxiety to secure its survival in this turbulent world among big powers and influential countries. Mongolia is a vibrant functioning frontier democracy island in the region becoming known little by little to others for its committed democratic advancement. Therefore, the world has important stake in the success of Mongolia’s democracy to illustrate to this or other region that democracy works and brings success. Mongolia has to do its utmost in order to ensure ASEM’s continued legacy in Ulaanbaatar adding new impetus to the Forum’s already impressive contribution to the cause of deepened mutual understanding and expanded cooperation between Asia and Europe. Q: In conclusion, what do you think about relations between Italy and Mongolia? Do you think that the preparation of the ASEM meeting could be a good chance to strengthen their relations? A: There are many areas where Mongolia and Italy may know each other well . For example, there are meaningful potentials in the fields of fashion, design, craftsmanship, history, culture, education, food and tourism. All these relations should flourish. Mongolia has significant agriculture which produces raw materials which could be further processed into globally competitive products. I think authorities of both countries should stimulate in every way possible initiatives in this regard. The forthcoming 2016 ASEM meeting in Ulaanbaatar is a priority agenda item on Mongolia’s foreign policy activities. We have to carefully study the great experience of Italy who so successfully chaired the previous ASEM meeting in Milan. I think the Mongolian side should initiate a study tour of a delegation to Rome and Milan to get thoroughly acquainted with details of organization on spot. Finally, I extend my deep appreciation and gratitude to the Italian Institute of Advanced Studies in Geopolitics and Auxiliary Sciences, and its esteemed Chairman Dr.Tiberio Graziani, for their kind cooperation and continued interests in Mongolia.